What is "pop" music? How do you define it? Is pop music simply, "that music which a lot of people like"? Or is it more than that? When i say "The The are a damned fine pop band" i am implying that their purpose is to write catchy songs that portray a snippet of human emotionality within the context of a narrative story told in 4/4 time. At least, that's my definition. That said, The The are a damned fine pop band. One of my favorites ever, in fact. Soul Mining was the first CD i purchased, back when i upgraded from cassette to CD in the late 80's! So i have a long history with this band. 45 RPM is a sort of "greatest hits" collection. Not that The The have ever really dominated the Billboard Top 40 in this country. What it really is, is a collection of singles released over the years, with two brand new tunes at the end. To spice things up, some of the songs are different versions than what you are most likely familiar with. For example, things start off with Uncertain Smile, a tune off of Soul Mining which is a personal favorite. However, this mix is ... different. Supposedly this is the "original version", and here Matt Johnson layers cheesey synthesized horns over the song in place of the wonderful piano work on the "album version". It's really different, and at first, i was really turned off by it. But it grew on me. I still think that it is a little weaker than the album version, but it's an interesting listen nonetheless. 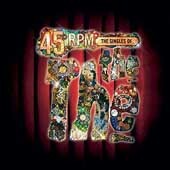 In total, 45 RPM tears through 13 The The classics from all of their numerous albums. Some of the tracks chosen are not necessarily my pick off of a given album, but what are you gonna do? The great thing about these songs is that even though many of them are from the 80's, they really stand up to the test of time. Sure, there are bits that seem dated (such as the cheesey 1986 sampled drum beat that starts Infected), but the overall strength of the rhythms, Johnson's forceful singing, and the wonderfully hummable melodies all make the music as alive today as it was back then. I still listen to a lot of 80's music. I still like it. But i can admit that, say, Erasure is very outdated. The Smiths are too, to a certain degree. But not The The. There is a difference there that i cannot explain really. Of course, it is entirely possible that i am, as Malimus would say, simply "being a fanboy". I really thing that Matt Johnson (who is the only constant in The The's many incarnations) has a real talent for writing catchy songs. He also is capable of writing a song with political content that doesn't come across as cheesey and overtly preachy. For example, Armageddon Days (Are Here Again) could be an intolerably cheesey tune. It starts off with Johnson calling on Buddha, Jesus, and Mohammed to lend him some back-up vocals. But it's toe-tapping rhythm and dramatic choruses make the song really work. Johnson's deep voice belts out his message of the stupidity of religous intolerance without seeming to beat you over the head with it. In fact, if you are bothered by the political content you can just ride the rollercoaster of the rhythm on this track. It seems to me that a lot of "politically active music" seems to be well, cheesey. I am not gonna name names here, but there are lots of examples. It's as if many people think that having a song that is about "real things" means that it doesn't need a melody: they count on the poltically charged lyrical content to carry it through. Billy Bragg is (usually) good about not doing this. So is Matt Johnson: his songs tend to be about real subjects, but he always tries to find a catchy melody to put with his politics. And that's the secret people: writing political songs doesn't mean that you can skimp on the actual musical content. It's a "political song": both words carry equal weight. Okay, one last comment on this issue: Johnson's politics seem to hold up over time. He has a song about religous war in the Middle East (Armageddon Days (Are Here Again)), a song about American Imperialism (Sweet Bird of Truth), and the most telling political tune on the disc: Heartland. This tune is off of 1986's Infected album, so it is full of New Wave dance beats. But it ends with Londoner Johnson singing over and over "This is the 51st state of the USA". If he felt like that in the 80's -- i wonder how he feels now? The political issues that Matt Johnson sings about are still important. That either means that he is a very wise person who can see right to the heart of our culture's diseases, or that we are not making any progress at all. I am not sure which is the case. That said -- if you are a diehard The The fan you have heard these tunes before. The "different mixes" strewn about make this collection essential for collector geeks. And then there are the new tunes. They are called Pillar Box Red and Deep Down Truth. Pillar Box Red is a slow, largely acoustic number that feels as if it would have been at home on Nakedself, the most recent The The album. It's a decent song, with a nicely done harpsichord sample that lends the proceedings a melancholic and reflective air. Deep Down Truth, on the other hand, is a The The rocker like those that filled Nakedself. Here Johnson is strumming an acoustic, and backed up by a female voice. The drums thud and the lead guitar wails. It's a good bluesy romp. However, in all honesty, i am not so sure that either song would have made the "greatest hits album" had they not been the "previously unreleased" songs tacked on at the end. That is to say, while neither song is weak, neither of them is an instant classic either. They are average tunes.